72 Units of Mens Winter Gloves, Assorted Solid Colors, Warm Acrylic Thermal Glove Magic Gloves - Knitted Stretch Gloves at low wholesale prices. alltimetrading.com offers Knitted Stretch Gloves at bulk discounted prices. If you're looking for a pack of winter gloves that will keep your hands cozy and relaxed this winter, look no further. These 100% soft & warm acrylic gloves are the perfect accessory to wear for outdoor activities, work, your commute, driving, sports, and more. It offers you the mobility to move and wiggle your fingers while protecting your hands from the brisk temperatures. 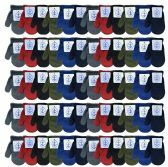 Makes as a great gift as it comes in 12 pair pack assortments which could keep a family of hands warm. Or, you could choose a different color for each different outfit you wear from day to day. If one pair is in the wash, grab another pair! Available for both men and women. Each glove provides enough stretch to provide comfort for most hand sizes. Made to keep your hands and fingers cozy.